This is a necessary book for me because in its focus on questions of memory and testimony in the context of political belief systems, it addresses the very significant question of how the experience of the Gulag differs from that of the Nazi concentration camps. The existence of ‘official’ narratives publicizing the work of labour camps (notably the White Sea Canal book) and loyalist narratives such as those by Boris Diakov and Georgy Shelest disrupts our understanding of Gulag writing as a primarily ‘dissident’ literary mode. The studies that have already addressed these texts, Cynthia Ruder’s Making History for Stalin (University Press of Florida, 1998) and Dariusz Tolczyk’s See no Evil (Yale University Press, 1999), although interesting in many ways, do not really integrate this phenomenon into the camp writing tradition. Adler’s book does not do so either, but this is because she uses narratives (and oral histories) to examine her subjects’ perception of events, rather than looking at them as narratives, which is my focus. Nevertheless, her analysis of communism as a faith system is useful in highlighting, for example, the ability of belief to survive contradictory evidence, the conception of the individual as less important than the larger whole, or the means justifying the ends, and the tendency to absolve the party of responsibility (in a sense the individual here comes back into play, but as a scapegoat, effectively confirming his or her insignificant status in relation to the party). These factors are no doubt significant, and yet in some ways they seem to me insufficient to explain the tenacity of belief in communism amongst some of its victims. It suggests that faith is inviolable, which is clearly not true. 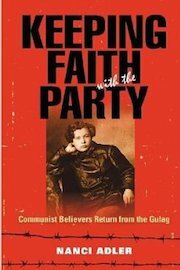 Faith is frequently accompanied by doubt; some people lose faith when faced with circumstances that challenge their beliefs, and that certainly happened to some communists. What made those who held onto their beliefs different? Was their belief in some way different, not allowing space for doubt? In which case was it fanaticism rather than faith? Or was it simply a matter of different personality types? And how many (or what proportion of) party members continued to believe despite their own victimization? Adler discusses some cases of communists who lost faith much later, even though it had survived the Gulag, but I didn’t really find an answer to those questions – probably because there is probably no more concrete answer (or statistics) to be found here than in relation to any faith system. Perhaps more comparison with people who did lose their faith would have helped in this regard. What did come across strongly was the sincerity of many of her subjects – an important consideration, as popular perceptions of the Gulag tend to assume that all those who supported it were mendacious. This was evidently not the case, despite the massive corruption in the system. At the same time, insincerity is reintroduced through the more practical explanations for maintaining belief, most significantly the fact that party membership remained the only viable route to self-advancement. This became especially important for those struggling with material difficulties and limited job prospects when they returned from the Gulag. But can this group of convicts and ex-convicts in any way be described as believers? So the picture that emerges from from Adler’s study is, unsurprisingly, one of mixed motives, and although the cases she examines are very interesting in themselves – and the book is worth reading for these alone – overall I was left slightly unsatisfied. I suspect that is because it doesn’t quite get beyond the position of an outsider looking in. But for insiders, one can see how it makes sense. For instance, Yuri Trifonov’s novel Disappearance (1987 – unfinished and unpublished during the author’s lifetime, but probably one of the best novels about the purges) gives us a typically subtle insight into the mentalities of that period. The main adult characters facing arrest, the Bayukov brothers – old Bolsheviks based on the author’s father and uncle – and their friends, including an ageing former prosecutor who has fallen out of favour with the rise of Andrei Vyshinsky, have little comprehension of why the purges are taking place and whether those arrested really are enemies. But they understand one thing quite clearly: they showed no mercy to the enemies of the revolution during the civil war, and they in turn expect none to be shown to them. What matters is the continued existence, and ultimate success, of the whole enterprise, so not only can others be sacrificed to the greater good, one also accepts one’s own sacrifice when necessary. What is remarkable – and Adler notes this several times – is that it didn’t seem to occur to anyone to ask whether (or why) such sacrifices were truly necessary, and what sort of party would demand them, or, to reformulate it in the language of the Thaw, would make such ‘mistakes’? This ultimately brings us back to the question I end up emphasizing repeatedly in my Russian Thought classes about the de-centring of the self, and the fact that the liberal subject has practically no place in Russian philosophy – does it make any substantial appearance outside Herzen’s thought? So in a sense examining the whole question of adherence to a collective ideal at the expense of the self is perhaps addressing the wrong issue, as this could be seen as the norm rather than the exception. In saying this I have no wish to downplay Adler’s achievement. Her research is very sound and she has unearthed some fascinating stories that shed new light on the experience of the Gulag. But for me the failure to get entirely to grips with this aspect of the subject raises significant questions, not least because of the centrality of conceptions of identity to some of my own recent articles on labour camp narratives (this post contains a link to one example), and to my book. So what is not said here gives me as much food for thought as what is.